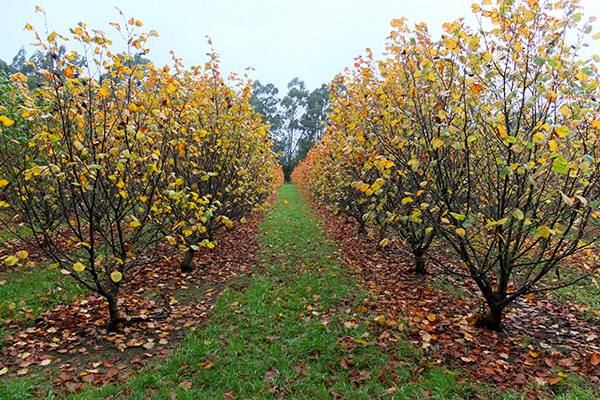 The Hazelnut Orchard fills the large paddock immediately behind the water race gardens. Enter through a small gate in the fence underneath the big Leyland Cypress shelter belt and immediately you'll see the rows of hazelnut trees. But there's more! In the grass you'll see a memorial row of specimen trees where dearly departed cats have been laid to rest. These all have beautiful spring blossom. Cats are a big part of my gardening life, and I find it very consoling to have a living reminder of them all. Stu the pet lamb is buried here, too, underneath a peach tree. He was such a character! 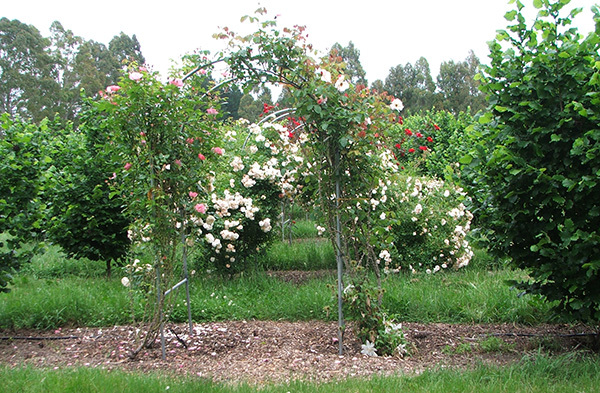 A long avenue of thirteen rose-covered archways reaches right into the middle of the orchard for summer enjoyment. Planning which climbing roses to buy was a most exciting experience. I got some right, and some spectacularly wrong! Oh well. Seven hundred hazelnut trees were planted in the winter of 2003, so you'll see photographs of them in various stages of growth. They started cropping in their seventh year. 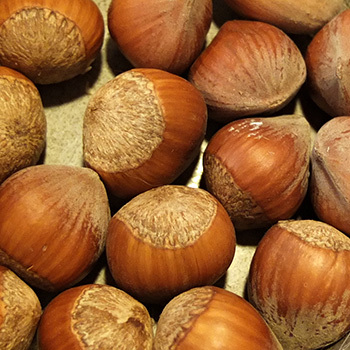 The nuts drop off themselves and are ready to be harvested in late autumn. The Moosey dogs have always enjoyed cracking the shells and munching the insides. Good roughage for their diets, I suppose. So with fragrant climbing roses, hazelnut trees, and occasionally some lazy sheep nibbling the grass down, the orchard is a relaxing place to wander around. Those nuts are hard for people to crack, though - careful! Better not try and use your teeth!